Fall is a beautiful time of year. Who doesn’t love the colorful canopy of autumn’s red and gold leaves? If you’re as much of a fan of the season as we are, then mark your calendar for Saturday, Oct. 14. That’s the day of Elmhurst’s Family Fall Fest. At Elmhurst Toyota, we look forward to this event every year. The Family Fall Fest is a great time for children and their parents. Best of all, admission is free this year. So, jump in the car and bring the family to this event, where activities include face painting, Safety Town trick-or-treating, a magician, an inflatable corn maze, balloon animals, a pumpkin toss, crafts and lots of fall games. This year, the Family Fall Fest is run by the Elmhurst Park District. The organization decided this should be a free event, so they eliminated the admission charge. “It is our mission to provide fun, recreational experiences to residents, and one of the ways we do that is by hosting a number of free events throughout the year,” said Jim Rogers, Executive Director of the Park District. Rogers said making the Family Fall Fest free to the public was an easy to decide to make. Attendees can look forward to other events, such as games and activities provided by local businesses. 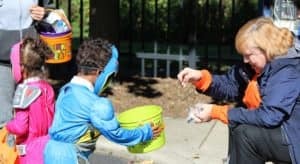 Members of the Elmhurst Police Department will distribute free trick-or-treat bags to the children. Food trucks will offer a variety of delicious meals and snacks to hungry festival attendees. Round up the family on Oct. 14, and head over to the Family Fall Fest for a fabulous day of festivities and fun! Saturday, Oct. 14, from 10 a.m. to 2 p.m. Learn more about the Family Fall Fest at the event’s Facebook page at www.facebook.com/events/522454488100414. You can also visit Elmhurst Park District’s Family Fall Fest webpage at www.epd.org/news/family-fall-fest.